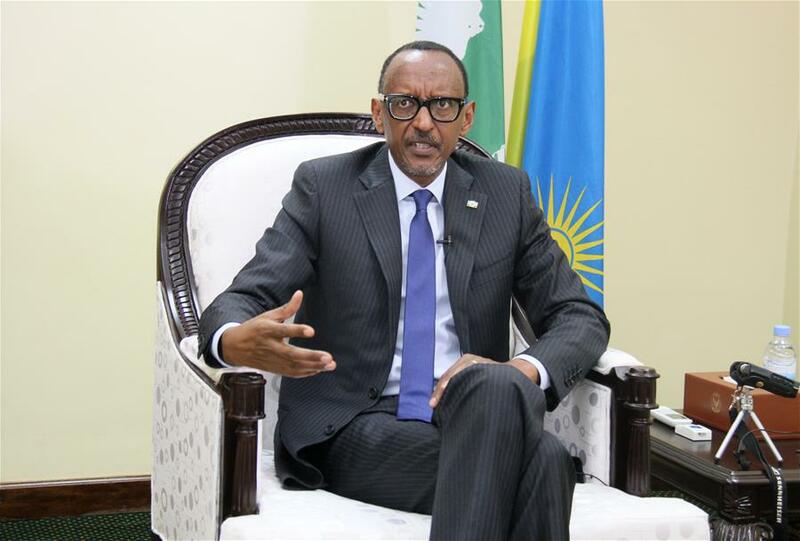 KIGALI, July 22 (Xinhua) -- The Rwanda-China relationship has grown stronger and the China-proposed Belt and Road Initiative has promoted development worldwide, including Africa, and achieved win-win outcomes, Rwandan President Paul Kagame said in a recent interview. China has actively participated in infrastructure construction in East Africa, especially in key projects such as the standard gauge railways, highways and power plants, which has benefited Rwanda, Kagame said in an interview with Chinese media ahead of Chinese President Xi Jinping's visit to the African country. Kagame said the Rwanda-China relationship has grown stronger with bilateral cooperation yielding fruitful results in such areas as infrastructure construction, health, education and agriculture. Governing China, a country with a large population, is quite challenging, Kagame said, adding that he was impressed that China had achieved rapid development despite all the challenges. According to data from the World Bank, Rwanda's economy has been growing rapidly from since over a decade ago and poverty has been rapidly reduced. On average, the country's GDP has been growing circa 8 percent every year between 2001 to 2015. Kagame attributed Rwanda's development to the people's active participation in the country's construction and the government's good management of resources. Rwanda has learnt from other countries, including China, and chosen its own development path, he said. As the rotating chairperson of the African Union (AU), Kagame said China can play an important role in supporting AU reforms and promoting Africa's development. Commenting on the Beijing summit of the Forum on China-Africa Cooperation scheduled for September, Kagame said it serves as a platform for participants to discuss and review the development of their cooperation, which is conducive to promoting common development. Regarding President Xi's concept of building a community with a shared future for mankind, Kagame said the idea is of great significance and will help promote the common development of China and other countries. In the interview, Kagame tried to pitch his country to the Chinese people. Rwanda is an attractive country where people can travel and do business, he said, wishing that Chinese enterprises would invest in Rwanda and enter regional markets through Rwanda. He expected that the Chinese people would come to Rwanda, explore and develop the country. The Chinese president was expected to arrive in Rwanda's capital city Kigali on Sunday for a state visit, the first by a Chinese head of state to the African country, after he has wrapped up his trips to the United Arab Emirates and Senegal. Chinese envoy lauds China-Rwanda relations as "historic significance"